3-In-1 Juice Pack – Amazing Taste And Super Delicious! Ravi from Delhi tried our “3-In-1 Juice Pack” and loved the amazing taste of all the drinks. He found them to be super delicious and satisfying. Read on to know more about what he has to say. Three of our best juices, in one pack! 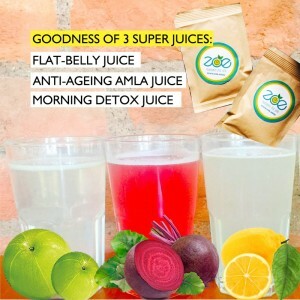 Contains 10 sachets each of Beet & Amla Juice, Amla Juice and Lemon & Ginger juice. Drink one glass a day to achieve your health goals! The human body is a machine and needs to be greased regularly. It requires essential nutrients to run smoothly. Most of you do not receive the micro nutrients required by your body in your daily diet. The amount of fast food consumed on a regular basis leads to obesity. It also affects our digestive system. Irregular eating habits affect the body’s metabolism and may lead to increased cholesterol, loss of appetite and over-eating. It may affect your internal body clock or “circadian rhythms” which follow a 24-hour cycle. 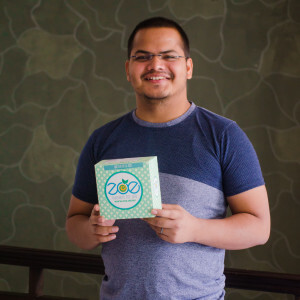 Zoe’s 3-in-1 juice pack consisting of 30 sachets makes sure that your body receives all the essential nutrients. Beetroot is low in fat, full of antioxidants, rich in Vitamin C and helps in absorption of iron. Undoubtedly, beetroot is one of the healthiest vegetables you can juice. Benefits of amla juice includes lowering cholesterol levels, regulating blood sugar levels , and optimizing digestion. It helps to stimulate the immune system; and accelerate growth and development process. Amla juice minimizes signs of ageing. Lemon and ginger juice have proven health benefits as they aid in weight loss. They are rich in Vitamin C and helps in waste elimination from the body. Have at-least one glass a day. You can also have two to three glasses if you’d like. It is a healthier and low calorie substitute for other beverages. Pour the contents of the sachet in a 200 ml – 300 ml glass. Add either chilled or normal water as per your liking. Stir the contents till everything dissolves. Read here to know whether “Cold Pressed Juices” cleanses or not. Comments to 3-In-1 Juice Pack – Amazing Taste And Super Delicious! All 3 juices (1 glass each ) should be consumed everyday ?